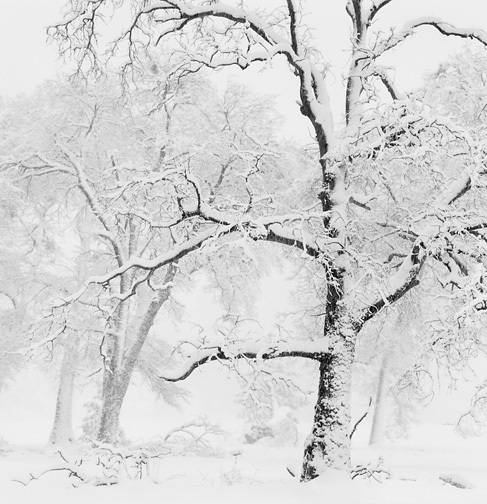 The image, Trees in Snowstorm, Yosemite Valley, was made in February 2011. It was an exceptional winter storm. Every morning we woke up to a winter wonder landscape. It was so beautiful. Normally I work with my 4x5 view camera, but on this particular late afternoon at El Capitan Meadow it was snowing so heavily with big wet snowflakes that I decided to use my Hasselblad. The camera was wrapped in a large Ziploc bag, with a cutout for the lens. I took one meter reading, set the aperture and shutter speed accordingly, and went out in the blowing snow. Once the roll of film was exposed, I would return to the van, reload the film magazine, check the exposure with my spotmeter, and rush back out looking for more images. The image Trees in Snowstorm, Yosemite Valley, is approximately 6-1/2 x 6-3/8", personally printed by me, processed to current archival standards, signed, numbered, mounted, and matted to 14 x 17” on 100 percent rag museum board. This print is offered in a Limited Edition of 75 numbered silver gelatin prints, plus 10 artist proofs. When the edition is sold out no further prints will be made for sale in any size. 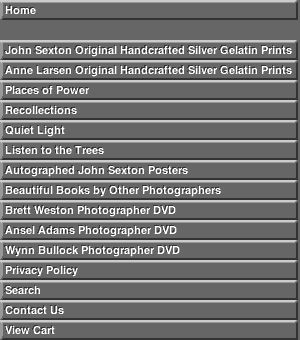 The current price for this limited edition photographic print is $650.